This is a defining moment for the United Nations. Will it stand strong, independent and true to its Charter, international law and the reasons for its being, or will it submit to the coercion of a superpower leading us toward a lawless world and condone war against the cradle of civilization? Why we must invade Iraq....NOT! Let it not be said that people in the United States did nothing when their government declared a war without limit and instituted stark new measures of repression. The signers of this statement call on the people of the US to resist the policies and overall political direction that have emerged since September 11 and which pose grave dangers to the people of the world. We believe that peoples and nations have the right to determine their own destiny, free from military coercion by great powers. We believe that all persons detained or prosecuted by the US government should have the same rights of due process. We believe that questioning, criticism, and dissent must be valued and protected. We understand that such rights and values are always contested and must be fought for. We believe that people of conscience must take responsibility for what their own governments do - we must first of all oppose the injustice that is done in our own name. Thus we call on all Americans to resist the war and repression that has been loosed on the world by the Bush administration. It is unjust, immoral and illegitimate. We choose to make common cause with the people of the world. We too watched with shock the horrific events of September 11. We too mourned the thousands of innocent dead and shook our heads at the terrible scenes of carnage - even as we recalled similar scenes in Baghdad, Panama City and, a generation ago, Vietnam. We too joined the anguished questioning of millions of Americans who asked why such a thing could happen. But the mourning had barely begun, when the highest leaders of the land unleashed a spirit of revenge. They put out a simplistic script of "good v evil" that was taken up by a pliant and intimidated media. They told us that asking why these terrible events had happened verged on treason. There was to be no debate. There were by definition no valid political or moral questions. The only possible answer was to be war abroad and repression at home. In our name, the Bush administration, with near unanimity from Congress, not only attacked Afghanistan but arrogated to itself and its allies the right to rain down military force anywhere and anytime. The brutal repercussions have been felt from the Philippines to Palestine. The government now openly prepares to wage all-out war on Iraq - a country which has no connection to the horror of September 11. What kind of world will this become if the US government has a blank cheque to drop commandos, assassins, and bombs wherever it wants? In our name the government has created two classes of people within the US: those to whom the basic rights of the US legal system are at least promised, and those who now seem to have no rights at all. The government rounded up more than 1,000 immigrants and detained them in secret and indefinitely. Hundreds have been deported and hundreds of others still languish today in prison. For the first time in decades, immigration procedures single out certain nationalities for unequal treatment. In our name, the government has brought down a pall of repression over society. The president's spokesperson warns people to "watch what they say". Dissident artists, intellectuals, and professors find their views distorted, attacked, and suppressed. The so-called Patriot Act - along with a host of similar measures on the state level - gives police sweeping new powers of search and seizure, supervised, if at all, by secret proceedings before secret courts. In our name, the executive has steadily usurped the roles and functions of the other branches of government. Military tribunals with lax rules of evidence and no right to appeal to the regular courts are put in place by executive order. Groups are declared "terrorist" at the stroke of a presidential pen. We must take the highest officers of the land seriously when they talk of a war that will last a generation and when they speak of a new domestic order. We are confronting a new openly imperial policy towards the world and a domestic policy that manufactures and manipulates fear to curtail rights. There is a deadly trajectory to the events of the past months that must be seen for what it is and resisted. Too many times in history people have waited until it was too late to resist. President Bush has declared: "You're either with us or against us." Here is our answer: We refuse to allow you to speak for all the American people. We will not give up our right to question. We will not hand over our consciences in return for a hollow promise of safety. We say not in our name. We refuse to be party to these wars and we repudiate any inference that they are being waged in our name or for our welfare. We extend a hand to those around the world suffering from these policies; we will show our solidarity in word and deed. We who sign this statement call on all Americans to join together to rise to this challenge. We applaud and support the questioning and protest now going on, even as we recognise the need for much, much more to actually stop this juggernaut. We draw inspiration from the Israeli reservists who, at great personal risk, declare "there is a limit" and refuse to serve in the occupation of the West Bank and Gaza. We draw on the many examples of resistance and conscience from the past of the US: from those who fought slavery with rebellions and the underground railroad, to those who defied the Vietnam war by refusing orders, resisting the draft, and standing in solidarity with resisters. Let us not allow the watching world to despair of our silence and our failure to act. Instead, let the world hear our pledge: we will resist the machinery of war and repression and rally others to do everything possible to stop it. C Clark Kissinger, Refuse & Resist! The following letter by former U.S. Attorney General Ramsey Clark has been sent to all members of the UN Security Council, with copies to the UN General Assembly. It is very powerful and wise. 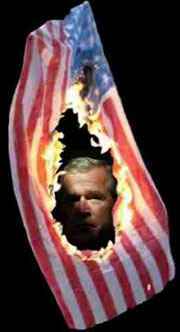 George Bush will invade Iraq unless restrained by the United Nations. Other international organizations-- including the European Union, the African Union, the OAS, the Arab League, stalwart nations courageous enough to speak out against superpower aggression, international peace movements, political leadership, and public opinion within the United States--must do their part for peace. If the United Nations, above all, fails to oppose a U.S. invasion of Iraq, it will forfeit its honor,integrity and raison d�etre. A military attack on Iraq is obviously criminal; completely inconsistent with urgent needs of the Peoples of the United Nations; unjustifiable on any legal or moral ground; irrational in light of the known facts; out of proportion to other existing threats of war and violence; and a dangerous adventure risking continuing conflict throughout the region and far beyond for years to come. The most careful analysis must be made as to why the world is subjected to such threats of violence by its only superpower, which could so safely and importantly lead us on the road to peace, and how the UN can avoid the human tragedy of yet another major assault on Iraq and the powerful stimulus for retaliatory terrorism it would create. 1. President George Bush Came to Office Determined to Attack Iraq and Change its Government. George Bush is moving at a pace to make his war unstoppable and soon. Having stated last Friday that he did not believe Iraq would accept UN inspectors, he responded to Iraq�s prompt, unconditional acceptance by calling any reliance on it a �false hope� and promising to attack Iraq alone if the UN does not act. He is obsessed with the desire to wage war against Iraq and install his surrogates to govern Iraq by force. Days after the most bellicose address ever made before the United Nations--an unprecedented assault on the Charter of the United Nations, the rule of law and the quest for peace--the U.S. announced it was changing its stated targets in Iraq over the past eleven years, from retaliation for threats and attacks on U.S. aircraft which were illegally invading Iraq�s airspace on a daily basis. How serious could those threats and attacks have been if no U.S. aircraft was ever hit? Yet hundreds of people were killed in Iraq by U.S. rockets and bombs, and not just in the so called �no fly zone,� but in Baghdad itself. Now the U.S. proclaims its intentions to destroy major military facilities in Iraq in preparation for its invasion, a clear promise of aggression now. Every day there are threats and more propaganda is unleashed to overcome resistance to George Bush�s rush to war. The acceleration will continue until the tanks roll, unless nonviolent persuasion prevails. 2. George Bush Is Leading the United States and Taking the UN and All Nations Toward a Lawless World of Endless Wars. George Bush in his �War on Terrorism� has asserted his right to attack any country, organization, or people first, without warning in his sole discretion. He and members of his administration have proclaimed the old restraints that law sought to impose on aggression by governments and repression of their people, no longer consistent with national security. Heinrich Himmler, who instructed the Nazi Gestapo �Shoot first, ask questions later, and I will protect you,� is vindicated by George Bush. Like the Germany described by Jorge Luis Borges in Deutsches Requiem,George Bush has now �proffered (the world) violence and faith in the sword,� as Nazi Germany did. And as Borges wrote, it did not matter to faith in the sword that Germany was defeated. �What matters is that violence ... now rules.� Two generations of Germans have rejected that faith. Their perseverance in the pursuit of peace will earn the respect of succeeding generations everywhere. The Peoples of the United Nations are threatened with the end of international law and protection for human rights by George Bush�s war on terrorism and determination to invade Iraq. Since George Bush proclaimed his �war on terrorism,� other countries have claimed the right to strike first. India and Pakistan brought the earth and their own people closer to nuclear conflict than at any time since October 1962 as a direct consequence of claims by the U.S. of the unrestricted right to pursue and kill terrorists, or attack nations protecting them, based on a unilateral decision without consulting the United Nations, a trial, or revealing any clear factual basis for claiming its targets are terrorists and confined to them. There is already a near epidemic of nations proclaiming the right to attack other nations or intensify violations of human rights of their own people on the basis of George Bush�s assertions of power in the war against terrorism. Mary Robinson, in her quietly courageous statements as her term as UN High Commissioner for Human Rights ended, has spoken of the �ripple effect� U.S. claims of right to strike first and suspend fundamental human rights protection is having. These additional threats to human rights follow Post-September 11 �emergency� plans to set up a network of a million informants in a nation of forty million. September 12, 2002, p. A7. 3. The United States, Not Iraq, Is the Greatest Single Threat to the Independence and Purpose of the United Nations. President Bush�s claim that Iraq is a threat justifying war is false. Eighty percent of Iraq�s military capacity was destroyed in 1991 according to the Pentagon. Ninety percent of materials and equipment required to manufacture weapons of mass destruction was destroyed by UN inspectors during more than eight years of inspections. Iraq was powerful, compared to most of its neighbors, in 1990. One infant out of four born live in Iraq weighs less than 2 kilos, promising short lives, illness and impaired development. In 1989, fewer than one in twenty infants born live weighed less than two kilos. Any threat to peace Iraq might become is remote, far less than that of many other nations and groups and cannot justify a violent assault. An attack on Iraq will make attacks in retaliation against the U.S. and governments which support its actions far more probable for years to come. George Bush proclaims Iraq a threat to the authority of the United Nations while U.S.-coerced UN sanctions continue to cause the death rate of the Iraqi people to increase. Deaths caused by sanctions have been at genocidal levels for twelve years. Iraq can only plead helplessly for an end to this crime against its people. The UN role in the sanctions against Iraq compromise and stain the UN�s integrity and honor. This makes it all the more important for the UN now to resist this war. Inspections were used as an excuse to continue sanctions for eight years while thousands of Iraqi children and elderly died each month. Iraq is the victim of criminal sanctions that should have been lifted in 1991. For every person killed by terrorist acts in the U.S. on 9/11, five hundred people have died in Iraq from sanctions. It is the U.S. that threatens not merely the authority of the United Nations, but its independence, integrity and hope for effectiveness. The U.S. pays UN dues if, when and in the amount it chooses. It coerces votes of members. It coerces choices of personnel on the Secretariat. It rejoined UNESCO to gain temporary favor after 18 years of opposition to its very purposes. It places spies in UN inspection teams. The U.S. has renounced treaties controlling nuclear weapons and their proliferation, voted against the protocol enabling enforcement of the Biological Weapons Convention, rejected the treaty banning land mines, endeavored to prevent its creation and since to cripple the International Criminal Court, and frustrated the Convention on the Child and the prohibition against using children in war. The U.S. has opposed virtually every other international effort to control and limit war, protect the environment, reduce poverty and protect health. George Bush cites two invasions of other countries by Iraq during the last 22 years. He ignores the many scores of U.S. invasions and assaults on other countries in Africa, Asia, and the Americas during the last 220 years, and the permanent seizure of lands from Native Americans and other nations--lands like Florida, Texas, Arizona, New Mexico, California, and Puerto Rico, among others, seized by force and threat. In the same last 22 years the U.S. has invaded, or assaulted Grenada, Nicaragua, Libya, Panama, Haiti, Somalia, Sudan, Iraq, Yugoslavia, Afghanistan and others directly, while supporting assaults and invasions elsewhere in Europe, Asia, Africa, and the Americas. It is healthy to remember that the U.S. invaded and occupied little Grenada in 1983 after a year of threats, killing hundreds of civilians and destroying its small mental hospital, where many patients died. In a surprise attack on the sleeping and defenseless cities of Tripoli and Benghazi in April 1986, the U.S. killed hundreds of civilians and damaged four foreign embassies. It launched 21 Tomahawk cruise missiles against the El Shifa pharmaceutical plant in Khartoum in August 1998, destroying the source of half the medicines available to the people of Sudan. For years it has armed forces in Uganda and southern Sudan fighting the government of Sudan. The U.S. has bombed Iraq on hundreds of occasions since the Gulf War, including this week, killing hundreds of people without a casualty or damage to an attacking plane. 4. Why Has George Bush Decided The U.S. Must Attack Iraq Now? There is no rational basis to believe Iraq is a threat to the United States, or any other country. The reason to attack Iraq must be found elsewhere. As governor of Texas, George Bush presided over scores of executions, more than any governor in the United States since the death penalty was reinstated in 1976 (after a hiatus from 1967). He revealed the same zeal he has shown for �regime change� for Iraq when he oversaw the executions of minors, women, retarded persons and aliens whose rights under the Vienna Convention on Diplomatic Relations of notification of their arrest to a foreign mission of their nationality were violated. The Supreme Court of the U.S. held that executions of a mentally retarded person constitute cruel and unusual punishment in violation of the U.S. Constitution. George Bush addresses the United Nations with these same values and willfulness. His motives may include to save a failing Presidency which has converted a healthy economy and treasury surplus into multi-trillion dollar losses; to fulfill the dream, which will become a nightmare, of a new world order to serve special interests in the U.S.; to settle a family grudge against Iraq; to weaken the Arab nation, one people at a time; to strike a Muslim nation to weaken Islam; to protect Israel, or make its position more dominant in the region; to secure control of Iraq�s oil to enrich U.S. interests, further dominate oil in the region and control oil prices. Aggression against Iraq for any of these purposes is criminal and a violation of a great many international conventions and laws including the General Assembly Resolution on the Definition of Aggression of December 14, 1974. Prior regime changes by the U.S. brought to power among a long list of tyrants, such leaders as the Shah of Iran, Mobutu in the Congo, Pinochet in Chile, all replacing democratically elected heads of government. 5. A Rational Policy Intended to Reduce the Threat of Weapons of Mass Destruction in The Middle East Must Include Israel. A UN or U.S. policy of selecting enemies of the U.S. for attack is criminal and can only heighten hatred, division, terrorism and lead to war. The U.S. gives Israel far more aid per capita than the total per capita income of sub Sahara Africans from all sources. U.S.-coerced sanctions have reduced per capita income for the people of Iraq by 75% since 1989. Per capita income in Israel over the past decade has been approximately 12 times the per capita income of Palestinians. Israel increased its decades-long attacks on the Palestinian people, using George Bush�s proclamation of war on terrorism as an excuse, to indiscriminately destroy cities and towns in the West Bank and Gaza and seize more land in violation of international law and repeated Security Council and General Assembly resolutions. Israel has a stockpile of hundreds of nuclear warheads derived from the United States, sophisticated rockets capable of accurate delivery at distances of several thousand kilometers, and contracts with the U.S. for joint development of more sophisticated rocketry and other arms with the U.S. Possession of weapons of mass destruction by a single nation in a region with a history of hostility promotes a race for proliferation and war. The UN must act to reduce and eliminate all weapons of mass destruction, not submit to demands to punish areas of evil and enemies of the superpower that possesses the majority of all such weapons and capacity for their delivery. Israel has violated and ignored more UN Resolutions for forty years than any other nation. It has done so with impunity. The violation of Security Council resolutions cannot be the basis for a UN-approved assault on any nation, or people, in a time of peace, or the absence of a threat of imminent attack, but comparable efforts to enforce Security Council resolutions must be made against all nations who violate them. 6. The Choice Is War Or Peace. The UN and the U.S. must seek peace, not war. An attack on Iraq may open a Pandora�s box that will condemn the world to decades of spreading violence. Peace is not only possible; it is essential, considering the heights to which science and technology have raised the human art of planetary and self-destruction. If George Bush is permitted to attack Iraq with or without the approval of the UN, he will become Public Enemy Number One--and the UN itself worse than useless, an accomplice in the wars it was created to end. The Peoples of the World then will have to find some way to begin again if they hope to end the scourge of war.